Time, once again, to hail yet another obscenely talented young musician from Finland. Sebastian Fagerlund ticks all the boxes: he's young (b. 1972), open-minded, happy to engage in multi-media projects, and, most importantly of all, he is writing music that is both forward-looking and audience friendly. 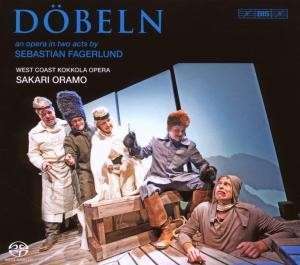 Listening to Döbeln, you'll be reminded of a number of Fagerlund's older contemporaries, in particular Magnus Lindberg. Like Lindberg, Fegerlund has a taste for the richer sonorities of the orchestra, bass clarinet for example and croaking bassoon. He also has a masterly grasp of percussion writing, a skill that allows him to texture and lighten almost any instrumental texture at a stroke. In fact, Fagerlund rarely indulges in dense textures, and this is the primary distinction between his work and that of his predecessors. You get all the drama of Lindberg or Salonen, but with fewer notes. Fewer instruments too. The orchestra for this opera consists of only 15 players, but the variety of sounds and textures he draws from the small group is extraordinary. Even more surprisingly, there is an almost complete avoidance of extended performance techniques, a few trombone glissandos and some nasal singing bordering on Tibetan overtone chant is as adventurous as it gets. Fagerlund is evidently a composer for whom drama matters: every aspect of the score is put to the service of the narrative, and anything that could distract is studiously avoided. The plot concerns a Finnish officer Georg Carl von Döbeln, who receives a head wound during a battle between Finland and Russia in the early 19th century. This causes him to have a series of hallucinatory dreams, in which other events from Finland's history, most notably its wars with Sweden, are played out. The opportunities for drama here are mediated to say the least. Battles play an important part, but dreams and visions are equally important. Without knowing exactly what is happening on the stage (the work has been done a disservice by not appearing on DVD) it is fair to say that Fagerlund locates his dramaturgy closer to the world of dreams than to graphic depictions of battlefield violence. The libretto is structured around seven dream episodes, and each is imbued with a specific mood and atmosphere. The most memorable is the sixth, in which Döbeln imagines himself to have been transformed into a fish. The aquatic environment is subtly suggested, rather than crudely outlined as other composers might, and the whole experience is satisfyingly surreal. Politics of national identity clearly play an important part in the conception of this work, but from the outside they are difficult to untangle. Finland as a nation defines itself through its distinction from Sweden and Russia, the two larger nations having occupied it for prolonged periods of its history. By dramatising Finland's conflicts with both countries, the work is clearly trying to make a point, as are the liner notes, which state, ironically or not, that the issues of national identity here were suggested to the composer by the fact that he was born on 6 December, Finnish Independence Day. But the paradoxes run deep. The relationship with Sweden, both of Finland itself and of this opera, is a complex issue. The libretto alternates between the two languages, with the Finnish protagonists speaking Swedish. This is allegedly a nod to historical accuracy, Swedish being the language that the historical figures themselves spoke, but a more political point is obviously being made. But what is it? Add to all this the fact that the recording is of Finnish performers, but was made in Sweden and for a Swedish label and you're no closer to solving the puzzle. As you'd expect from BIS, the recording is excellent, and respect to the label for their continued championing of SACD, and for their use of it outside of the core repertoire. The recording was made in a concert hall, without an audience I think, and without staging. Singing and playing are to a consistently high standard, and all of the performers are helped by the composer's innate (or possibly hard-earned) grasp of idiomatic orchestration. This is an excellent introduction to the work of a promising new voice from Finland. Here's hoping the DVD won't be too far behind.